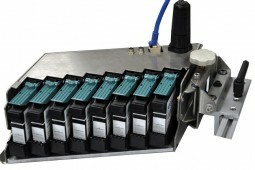 The HP 45 style inkjet cartridge system has been a standard in the mailing industry for many years. We combined proven HP technology with our advanced proprietary software to develop a system with greater capabilities than the competition. DDS’ iDataPrint™ 45 Series inkjet solutions gives you the ability to print individually specific variable data, text, barcodes, logos, graphics and Permit Mail Indicia, as the material passes under the printhead. There are a vast array of inks available in many colors in water based and solvent formulas. New inks are developed each year for this technology. Automatic Print Job Loading – With an available handheld barcode scanner connected, iDataPrint™ can automatically load print jobs by scanning a Job ID barcode. 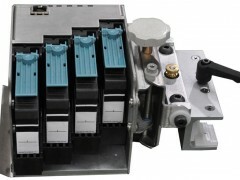 Control External Devices – iDataPrint™ can be configured to send out I/O signals for any number of events to turn on an annunciator or perform more complex tasks such as controlling an inserter or other equipment. Ink Level Monitoring – iDataPrint™ can keep track of ink usage and issue warnings and instructions to the operator when ink level reaches user-specified level. Print Cartridge Identification – iDataPrint™ along with its network capability allows you to monitor and track ink usage between additional iDataPrint™ systems within your facility. Print Mode Options – Read-and-Print dynamic printing, sequential printing and repeated sequential printing as well as fixed message printing. Print Width – A single iDataPrint™ controller can drive any combination of ½”, 2”, 4”, and 8” print imagers up to 32” total print width. Read and Print Option – Communicates with DDS’ iDataScan™ for Read & Print solutions for seamless integration. Live Assistance – If you need any help, simply click Live Assistance right from the built-in Help menu, and a representative will be on-line to assist you in seconds.